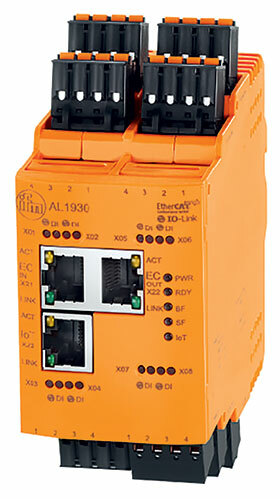 The IO-Link master modules for the control cabinet serve as a gateway between intelligent IO-Link sensors and the fieldbus, allowing important information from intelligent sensors to be sent into the IT world. With a separate IoT Ethernet socket, the IT network can be set up completely separately from the automation network with sensor information is transferred into the IT world via the established TCP/IP JSON interface. Machine uptime is of highest priority. The automation network must by no means be interrupted by external factors. Therefore the unit features a separate IoT Ethernet socket separating IT and the automation network. This means that important sensor information can be safely sent to the IT and ERP systems. The sensors and actuators are connected via standard M12 connection cables without screening. The connection cables are fixed via removable Combicon connectors on the IO-Link master. Up to 8 IO-Link sensors can be connected and be supplied with up to 3,6 A. The cable between the IO-Link master and sensor can be up to 20 metres long. The sensor data is transferred digitally. Unlike analog signals, contact resistance and EMC interference cannot corrupt the signals.